Bed bugs are not regarded as disease carriers, but their blood feeding can cause severe irritation in some people, resulting in loss of sleep, lack of energy and listlessness, particularly in children. Iron deficiency in infants has resulted from exces sive feeding by bed bugs. The bite often gives rise to a hard, whitish swelling which distinguishes it from the flea bite which leaves a dark red spot surrounded by a reddened area. Different individuals react differently to bites, some gaining immunity. Probably more important, however, is the distaste with which these insects are regarded. Bed bug excrement gives a characteristic speckled appearance to their harbourages, whilst their ‘stink glands’ confer a distinctive and unpleasant almond like smell on infested rooms. In addition, the very thought of being preyed upon by such creatures is quite sufficient to make most people take immediate action to control them. The bed bug may even help to reduce living standards by driving away householders with reasonable standards of hygiene, leaving behind only those who are less concerned with such matters. 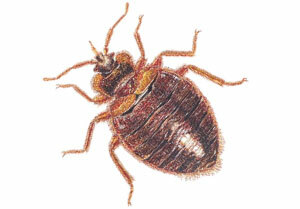 It is interesting to note that many factors are helping to sustain existing bed bug populations: modern building techniques, which allow easy access between adjoining properties; the increased use of central heating, which allows continued feeding and proliferation during winter; the movement of furniture in the second-hand market, which aids their distribution; all these serve to maintain population levels. * Can be resistant to most insecticides, more than one treatment is normally necessary. In all infestations, particularly those newly established in well-kept houses, an attempt should be made to determine the source of infestation, so that proper measures can be taken. A thorough inspection of infested premises should also seek to uncover the extent of the infestation, since the measures necessary for control will depend on whether the infestation is established and widely distributed throughout the premises, or recently introduced and likely to be more localised. Control measures used must be thorough and be directed at all the harbourages. In circumstances where the infestation has originated from birds’ nests, it will be necessary to treat the nests and advisable to bird proof the building. High standards of hygiene and housekeeping are unlikely to provide an adequate method of control, but will reveal the presence of bed bugs at an early stage, making control easier. Bed bugs can only proliferate if they are tolerated. If they are suspected, a close inspection of the bed, the mattress around the seems, the back of the headboard, etc., should reveal their presence. The use of a pyrethroid-based aerosol sprayed around these areas may help, as the insects will be driven out of their hiding places. The finding of eggs or egg cases and the blackish spots of bug excrement will also indicate their presence. Infested bedding (e.g. sheets) and clothing should be laundered or burnt and the fabric of infested rooms thoroughly cleaned. Particular attention should be paid to removing dust, fluff and debris from insect harbourages e.g. cracks, crevices, seams of fabrics, buttons on mattresses etc. To eradicate the infestation it will be necessary to treat the premises thoroughly with suitable insecticides, including the beds, other furniture and harbourages in the fabric of infested rooms. A professional pest control organisation should be used, as the detection and thorough treatment of all bed bug hiding places is a job which requires experience.